1) Catch it by hand and take it outside (you can use a tool like a snake grabber, or thick gloves or a towel). If you can't do this, you can call out a pro to do it for you. 2) A basement is an ideal place to set a snake trap, which will quickly catch it, and then you can take it outside and release it. After you have removed any snakes in the cellar, you need to find out how they got in in the first place, then seal those gaps shut! Snakes can't dig or chew, so you can just use a simple sealant to seal up the open gaps leading from outside into your basement. If you named all the places you might find a snake, the basement usually isn’t high on your list. When people think of snakes, they think of snakes in the backyard, under the deck, or living in the cracks of a shed foundation. In reality, snakes can and will go anywhere they can fit—and if there is a way into your basement, then they will find it. Snakes naturally look for large rocks with cracks in which to sleep, and basements are usually constructed of concrete or cinderblocks. Older houses with cracked foundations or windows at ground level are particularly at risk. Just because snakes don’t have legs doesn’t mean they can’t climb. In fact, some snakes are excellent climbers, scaling trees to feast on bird eggs. The appeal of a basement is simple: the space is usually a constant temperature, quiet, and free of activity. Unfinished basements are often littered with cracks, water, and cobwebs. For a snake looking to hibernate, this type of environment is ideal. More often than not, a snake will enter a basement through a crack or broken window and will be unable to find its way out again. This is the snake that is curled up under the laundry basket or slithering along the base of the wall. If the snake has an obvious exit and entrance point, it will likely remain nearby, making escape easy if necessary. If you’ve found a snake in the basement, your first task is to determine what kind of snake you have. There are many species of snakes throughout the world, and many non-poisonous snakes can resemble poisonous snakes and vice versa. While it is possible to remove a snake from your home on your own, keep in mind the repercussions of a snake bite, especially if you don’t know for certain what type of snake you have. Snake venom is usually very fast acting and requires an antidote to negate. Even then, the damage to tissue surrounding the area can be significant. Many snake venoms can and will kill a person. Removing such a snake on your own is not worth the risk. If you have a non-venomous snake, the easiest way to get it out of your home is to catch it. There are a number of snake traps on the market, and only a few really work. Do some research and determine which trap has the best chance. Trapping is the most advisable method because you can avoid any unnecessary handling of the snake itself. Other methods of catching snakes in the basement include tossing a towel or sheet over the reptile and then scooping it into a basket or a pillow case. If you have nerves of steel and the wriggling snake doesn’t make your skin crawl, this method might work. Again, if the snake is venomous, or if you simply don’t know, this method is not advisable. Many professionals have special snake snares which allow the handler to control the head of the snake without being close enough for a bite. 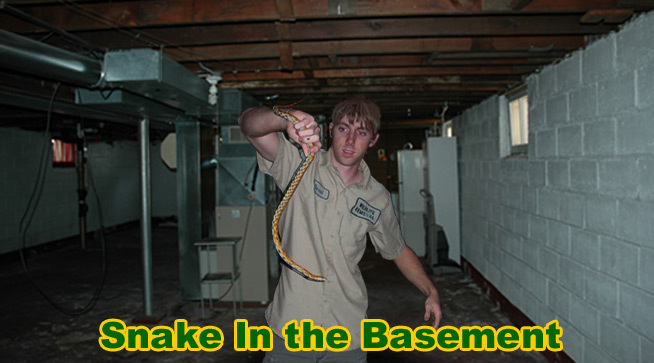 Once the snake is out of your home, you need to address the issue of the basement. How did the snake get in there in the first place? Cinderblock foundations can be more troublesome than concrete. Often times the mortar between blocks will break away as it ages, exposing the seams. Many constructors of older homes did not fill in the center of the cinderblocks (which contain two holes). This empty center can be an ideal living area for a snake. If the mortar crack is deep enough, it will allow the snake access to the basement. A similar issue surrounds concrete. Cracks in a foundation caused by house-settling and ground movement will offer an opportunity for a reptile to move right in. Windows at ground level should also be inspected. Broken windows or poorly sealed sills can be entrance points. Any gaps should be sealed as quickly as possible. Snakes cannot dig or chew away the patches you apply to your home. Fixing old mortar and foundation cracks will also help prevent your home from becoming structurally unsound in the future. We've covered the area below the house, but what aboiut above? Read about how to find and remove a snake in your attic. For more information, go to my Snake Removal - How to Get Rid of Snakes home page. You can also visit Keep Snakes Out of Your House or Yard for more info on that subject.